Hindu nationalism has been collectively referred to as the expressions of social and political thought, based on the native spiritual and cultural traditions of the Indian subcontinent. Some scholars have argued that the use of the term "Hindu nationalism" to refer to Hindū rāṣṭravāda is a simplistic translation and is better described by the term "Hindu polity". 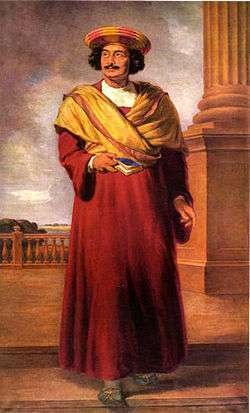 Raja Ram Mohan Roy endeavoured to create from the ancient Upanishadic texts a vision of rationalist modern India. Arya Samaj is considered one Hindu renaissance movements of the late nineteenth century. Arya Samaj is often considered as a social movement, many revolutionaries and political leaders of the Indian Independence movement like Ramprasad Bismil, Bhagat Singh, Shyamji Krishnavarma, Bhai Paramanand and Lala Lajpat Rai were to be inspired by it. Another 19th century Hindu reformer was Swami Vivekananda. Vivekananda as a student was educated in contemporary Western thought. He joined Brahmo Samaj briefly before meeting Ramakrishna, who was a priest in the temple of the goddess Kali in Calcutta and who was to become his guru. Under the influence of Orientalism, Perennialism and Universalism, Vivekananda re-interpreted Advaita Vedanta, presenting it as the essence of Hindu spirituality, and the pinnacle indeed of the development of human's religiosity. This project started with Ram Mohan Roy of Brahmo Samaj, who collaborated with the Unitarian Church, and propagated a strict monotheism. This reinterpretation produced neo-Vedanta, in which Advaita Vedanta was combined with disciplines such as yoga and the concept of social service to attain perfection from the ascetic traditions in what Vivekananda called the "practical Vedanta". The practical side essentially included participation in social reform. He made Hindu spirituality, intellectually available to the Westernized audience. His famous speech at the Parliament of the World's Religions at Chicago on 11 September 1893, followed huge reception of his thought in the West and made him a celebrity in the West and subsequently in India too. 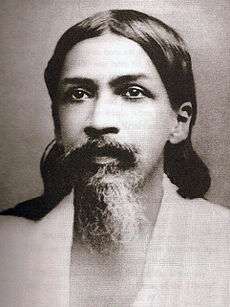 His influence can still be discerned in popular western spirituality, such as nondualism, New Age and the veneration of Ramana Maharshi. A major element of Vivekananda's message was nationalist. He saw his effort very much in terms of a revitalisation of the Hindu nation, which carried Hindu spirituality and which could counter Western materialism. The notions of White supremacy and Western superiority, strongly believed by the colonizers, were to be questioned based on Hindu spirituality. This kind of spiritual Hinduism was later carried forward by Mahatma Gandhi and Sarvepalli Radhakrishnan. It also became a main inspiration for the current brand of Hindu nationalism today. One of the most revered leaders of the Rashtriya Swayamsevak Sangh (RSS), Babasaheb Apte's lifelong pet sentence was "Vivekananda is like Gita for the RSS." Historians have observed that this helped the nascent Independence movement with a distinct national identity and kept it from being the simple derivative function of European nationalisms. In 1910, he withdrew from political life and spent his remaining life doing spiritual exercises and writing. But his works kept inspiring revolutionaries and struggles for independence, including the famous Chittagong Uprising. 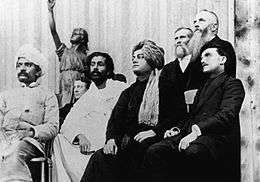 Both Swami Vivekananda and Sri Aurobindo are credited with having founded the basis for a vision of freedom and glory for India in the spiritual richness and heritage of Hinduism. A revolutionary movement was started by Shyamji Krishnavarma, a Sanskritist and an Arya Samajist, in London, under the name of India House in 1905. The brain behind this movement was said to be V D Savarkar. Krishnaverma also published a monthly "Indian Sociologist", where the idea of an armed struggle against the British was openly espoused. The movement had become well known for its activities in the Indian expatriates in London. When Gandhi visited London in 1909, he shared a platform with the revolutionaries where both the parties politely agreed to disagree, on the question of violent struggle against British and whether Ramayana justified such violence. 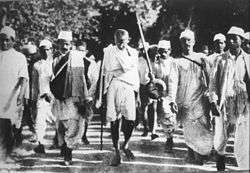 Gandhi, while admiring the "patriotism" of the young revolutionaries, had dissented vociferously from their violent blueprints for social change. In turn the revolutionaries disliked his adherence to constitutionalism and his close contacts with moderate leaders of Indian National Congress. Moreover, they considered his method of "passive resistance" effeminate and humiliating. “Lal-Bal-Pal” is the phrase that is used to refer to the three nationalist leaders Lala Lajpat Rai, Bal Gangadhar Tilak and Bipin Chandra Pal who held the sway over the Indian Nationalist movement and the independence struggle in the early parts of twentieth century. Bal Gangadhar Tilak was a nationalist leader from the Central Indian province of Maharashtra. He has been widely acclaimed the "Father of Indian unrest" who used the press and Hindu occasions like Ganesh Chaturthi and symbols like the Cow to create unrest against the British administration in India. 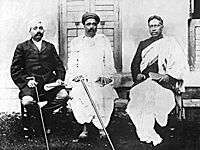 Tilak joined the Indian National Congress in 1890. Under the influence of such leaders, the political discourse of the Congress moved from polite accusation that imperial rule was “un-British” to the forthright claim of Tilak that “Swaraj is my birthright and I will have it”. 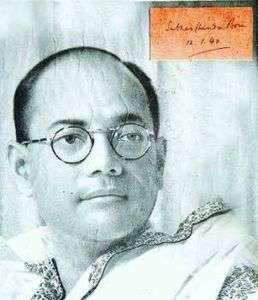 Apart from Gandhi, revolutionary leader Netaji Subhas Chandra Bose referred to Vedanta and the Bhagavad Gita as sources of inspiration for the struggle against the British. Swami Vivekananda's teachings on universalism, his nationalist thoughts and his emphasis on social service and reform had all inspired Subhas Chandra Bose from his very young days. The fresh interpretation of the India's ancient scriptures appealed immensely to Subhas. Hindu spirituality formed the essential part of his political and social thought through his adult life, although there was no sense of bigotry or orthodoxy in it. Subhas who called himself a socialist, believed that socialism in India owed its origins to Swami Vivekananda. As historian Leonard Gordan explains "Inner religious explorations continued to be a part of his adult life. This set him apart from the slowly growing number of atheistic socialists and communists who dotted the Indian landscape." "Hinduism was an essential part of his Indianess". His strategy against the British also included the use of Hindu symbols and festivals. In 1925, while in Mandalay jail, he went on a hunger strike when Durga puja was not supported by prison authorities. Another leader of prime importance in the ascent of Hindu nationalism was Dr Keshav Baliram Hedgewar of Nagpur. Hedgewar as a medical student in Calcutta had been part of the revolutionary activities of the Hindu Mahasabha, Anushilan Samiti and Jugantar. He was charged with sedition in 1921 by the British Administration and served a year in prison. He was briefly a member of Indian National Congress. In 1925, he left the Congress to form the Rashtriya Swayamsevak Sangh with the help of Hindu Mahasabha Leader B. S. Moonje, Bapuji Soni, Gatate Ji etc., which would become the focal point of Hindu movements in Independent India. After the formation of the RSS too, Hedgewar was to take part in the Indian National Congress led movements against the British rule. He joined the Jungle Satyagraha agitation in 1931 and served a second term in prison. The Rashtriya Swayamsevak Sangh started by him became one of the most prominent Hindu organisation with its influence ranging in the social and political spheres of India. The RSS portrayed itself as a social movement rather than a political party, and did not play central role many of the Indian independence movement. However, the RSS emphatically rejected the Congress policy of cooperation with the Muslims. Subsequently, in 1934, the Congress banned its members from joining RSS, Hindu Mahasabha or Muslim League. He died in 1940. 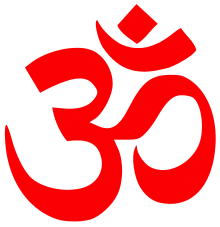 The word "Hindu", throughout history, had been used as an inclusive description which lacked a definition and was used to refer to the native traditions and people of India. It was only in the late eighteenth century that the word "Hindu" came to be used extensively with religious connotation, while still being used as a synecdoche describing the indigenuous traditions. "Those creeds (Islam and Christianity) have but one prophet, one scripture and one God, other than whom there is no path of salvation for the human soul. It requires no great intelligence to see the absurdity of such a proposition." 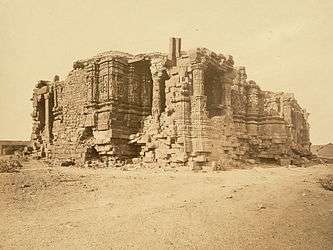 Before Independence, Prabhas Pattan where Somnath is located was part of the Junagadh State, ruled by the Nawab of Junagarh. On the eve of Independence the Nawab announced the accession of Junagarh, which had over 80% Hindu population, to Pakistan. The people of Junagarh rose in revolt and set up a parallel government under Gandhian leader and independence fighter, Shri Samaldas Gandhi. The Nawab, unable to resist the popular pressure, bowed out and escaped to Pakistan. The provincial government under Samaldas Gandhi formally asked Government of India to take over. The Deputy Prime Minister of India, Sardar Patel came to Junagadh on 12 November 1947 to direct the occupation of the state by the Indian army and at the same time ordered the reconstruction of the Somanath temple. This episode created a serious rift between the then prime minister Jawaharlal Nehru, who saw in movement for reconstruction of the temple an attempt at Hindu revivalism and the president Rajendra Prasad and Union Minister K. M. Munshi, saw in its reconstruction, the fruits of independence and the reversal of injustice done to Hindus. The Ayodhya dispute (Hindi: अयोध्या विवाद, Urdu: ایودھیا وِواد‎) is a political, historical and socio-religious debate in India, centred on a plot of land in the city of Ayodhya, located in Faizabad district, Uttar Pradesh. The main issues revolve around access to a site traditionally regarded as the birthplace of the Hindu deity Rama, the history and location of the Babri Mosque at the site, and whether a previous Hindu temple was demolished or modified to create the mosque. Panun Kashmir (Kashmiri: पनुन कश्मीर (Devanagari), پنون کشمیر (Nastaleeq)) is an organisation of displaced Kashmiri Pandits (Kashmiri Hindus) founded in December 1990 in Jammu, in order to demand that a separate homeland for Kashmir's Hindu population be carved out of the overwhelmingly Muslim Valley of Kashmir. Almost the entire Pandit population was expelled from Kashmir in 1990 by separatist militants for their allegedly pro-India political beliefs. ↑ Jain, Girilal (1994). The Hindu Phenomenon. New Delhi: UBS Publishers' Distributors. ISBN 81-86112-32-4. 1 2 3 4 5 6 7 Bhatt, Chetan, Hindu Nationalism: Origins, Ideologies and Modern Myths, Berg Publishers (2001), ISBN 978-1-85973-348-6. 1 2 Mahajan, Vidya Dhar and Savitri Mahajan (1971). Constitutional history of India, including the nationalist movement (6th edition). Delhi: S. Chand. 1 2 3 King 2002. ↑ Graham 1968, pp. 350-352. 1 2 Shankar Gopalakrishnan (2009). A Mass Movement Against Democracy: The Threat of the Sangh Parivar. Aakar Books. p. 21. ISBN 978-81-89833-90-9. 1 2 Martha Craven Nussbaum (2008). The Clash Within: Democracy, Religious Violence, and India's Future. Harvard University Press. pp. 156–. ISBN 978-0-674-03059-6. 1 2 M. G. Chitkara (1 January 2004). Rashtriya Swayamsevak Sangh: National Upsurge. APH Publishing. pp. 251–254. ISBN 978-81-7648-465-7. 1 2 Abdul Gafoor Abdul Majeed Noorani (2000). The RSS and the BJP: A Division of Labour. LeftWord Books. p. 60. ISBN 978-81-87496-13-7. ↑ Paranjoy Guha Thakurta; Shankar Raghuraman (2004). A Time of Coalitions: Divided We Stand. SAGE. p. 131. ↑ RSS also played an important role in anti-Muslim violence during the partition of India in 1947. ↑ Elst, Koenraad (2005). Decolonizing the Hindu mind. India: Rupa. p. 21. ISBN 81-7167-519-0. ↑ Bhave, Y.G (1995-01-01). The first prime minister of India By Y. G. Bhave. p. 49. ISBN 9788172110611. ↑ "Family legacy and the Varun effect". rediff.com. Retrieved 15 February 2015. ↑ Elst, Koenraad (2005). Decolonizing the Hindu mind. India: Rupa. pp. 480–486. ISBN 81-7167-519-0. ↑ Agrawal, Premendra. "Supreme Court on Hindu Hindutva and Hinduism". newsanalysisindia.com. ↑ "Ghar Wapsi continues in Kerala; 58 more embrace Hinduism". Rediff News (December 25, 2014). December 25, 2014. Retrieved 29 December 2014. ↑ "'Ghar wapsi' only way to end terror says BJP leader". Hindustan Times. December 25, 2014. Retrieved 29 December 2014. ↑ Archived 27 December 2014 at the Wayback Machine. ↑ "'Education, healthcare before ghar wapsi'". The Indian Express. Retrieved 4 January 2015.